At our GREENLAKE location, we have 4 float tanks, in 3 different styles. All of them are dialed in for optimal floating, with mostly aesthetic differences. We recommend trying them all before settling on a favorite! Traditional meets traditional. A favorite of the avid floater. 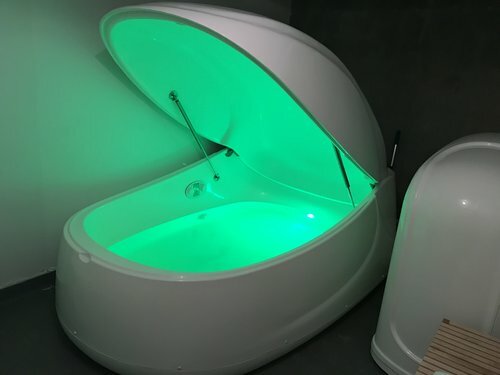 No light on the inside — one less step on your way to a true sensory deprivation experience. Nervous about floating in a smaller space? The Ocean Room is your answer! Roomy with a high ceiling and a guiding light to see your way in. The original commercial float tank & one of our two Samadhi tanks. Slightly slimmer than Ocean & Oasis, but consistent and accommodating all the same. An optional guiding light can be controlled from inside. Named “Infinity” to differentiate upon booking. Our 2nd Samadhi tank. They may not look like much, but trust us, the experience inside is top-notch. A float purist’s favorite. Rooms 1, 2, and 3 in BELLEVUE are the same. They've got Evolution Float Pods and they're tremendous. Roomy, great air flow, and while they have colored lights and some optional music choices, we still recommend the dark and quiet. Room 4 is our brand new ProFloat Cabin, like our Ocean room in Greenlake but even bigger. This is the most spacious of all of our tanks!